If you use a parallel dongle and you have a device, such as a printer, connected to the back of the dongle, you should make sure this device is turned on when you use Déjà Vu X. If you have already created a ticket about this issue, you don't need to create a new ticket; just add this information to the ticket. Select the version of Déjà Vu that you are using to find out how to install the dongle. Déjà Vu X allows you to use 2 different kinds of dongles, one that fits in the USB port and one that fits into the Parallel Port or Printer Port. Make sure that the dongle is not connected to the computer before you begin following these instructions. Execute it by double-clicking on it. Insert the dongle into a USB port. Now the correct driver should automatically be installed. Windows may start a New Hardware Wizard to configure the driver for the dongle. You can complete the wizard by clicking Next on every page until it finishes. 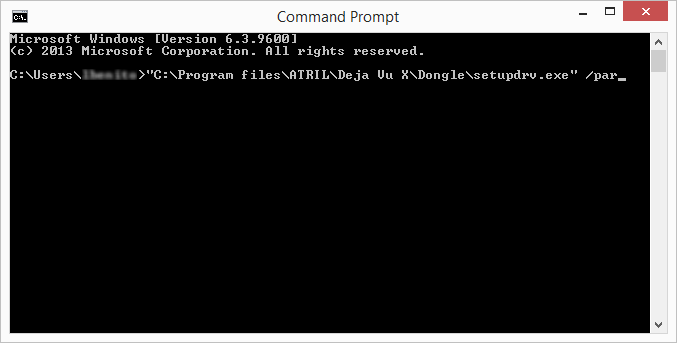 If Déjà Vu X continues to run in demo mode, execute ddlook.exe and then create a new ticket in the Helpdesknote with the information it shows, including any extended error messages. Make sure that the dongle is not connected to your computer's parallel or printer port. (make sure the /par is outside the quotes). Connect the dongle to the parallel port of your computer. If there is any other device connected to the dongle, make sure that it is turned onnote. Unlike Déjà Vu X, Déjà Vu X2 only supports a USB dongle. The USB dongle included with Déjà Vu X2 is a different model from the one that Déjà Vu X uses, and they are not compatible. However, the model used by Déjà Vu X2 is a more advanced model that does not require a proprietary driver, so installing it is easier. To install the dongle, simply plug it into any available USB port on your computer. If the dongle is connected to your computer but Déjà Vu X2 is not activated, run DinkeyLook to get information about the dongle's current state, and then create a new ticket in the Helpdesknote with that information. Déjà Vu X3 does not support dongle activation. It can only be activated with an activation code.